A gravel driveway is the perfect choice for a countryside residence and is also your cheapest driveway option. 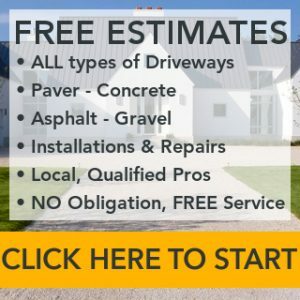 In this driveway guide we will look at the many different types of gravel you can use to create your own unique style. We will also address the cost of gravel driveway installation and what you should look for from a contractor. And we also tackle what you need to know about driveway gravel drainage and edging, as well as maintenance and repair costs. The type of driveway gravel you select for the top layer of your driveway will affect its aesthetics, of course, and to a lesser extent, its performance. Regardless of what the finish layer will be, most gravel driveways have a base layer of 4” to 6” stones followed by a second layer 2” to 3” stones. Road gravel driveways: Road gravel is the most affordable type of driveway gravel. Its makeup is clay and small stones, typically crushed or naturally angular stones that hold together better than round, smooth stones. The exact mix, and therefore the color, in road gravel varies from region to region. Commonly blends are medium to dark brown, shades of gray, light brown or yellow and rusty red to reddish pink. Crushed limestone driveways: Crushed limestone has an appealing gray-white color, though it can be dusty, leaving a coating of whitish powder on shoes and cars. It is quite affordable. Crushed stone driveways: Besides limestone, granite, gneiss, dolomite and trap rock are popular for driveways. The stone is screened and sorted for size; the angled rather than round edges cause the stones to support one another to create a stable base. 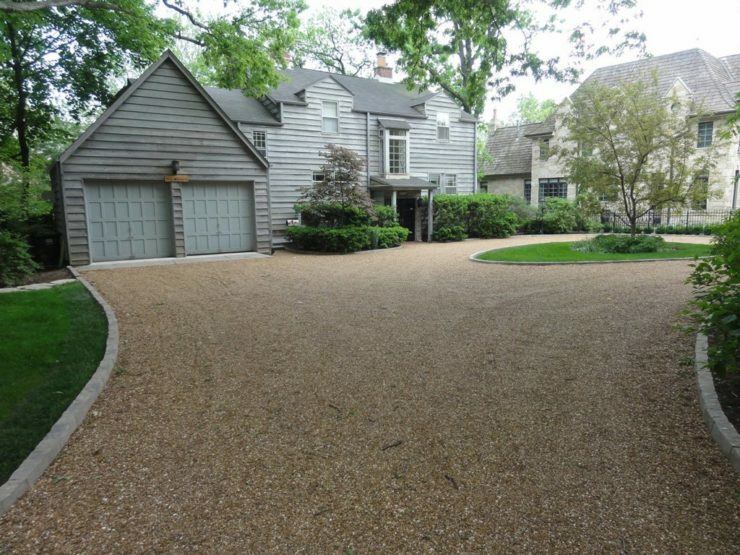 The color of crushed stone for driveways varies widely, and they can be dusty like limestone. Washed stone driveways: Crushed stone that is put through a washer holds like other crushed stone but doesn’t contain the dust, so it is cleaner for you and your vehicle. Quarry process gravel driveways: Also called QP or crusher run, quarry process stone is crushed stone and stone dust that compacts and binds quite well as the dust forms something like cement. Pea gravel driveways: Pea-sized stones in a blend of colors are popular for upscale gravel driveways. The stone is washed. While attractive, pea gravel driveways can form ruts easier than most, and the gravel is easily scattered into the surrounding landscape. White marble chips: This is a crushed, washed stone with a bit of glimmer. Though the cost is higher, it is visually appealing. Here are the basic steps taken by driveway contractors when installing an upgraded or new gravel drive. Note: In lieu of using a base layer of 6” stone and a second layer of smaller stone, some contractors install single 8-9 inches of 2”-3” before finishing the drive with the top layer. Water is the nemesis of gravel because it causes erosion. Gravel drains very well, but standing water alongside gravel softens and weakens forms of it containing clay and/or dust. Running water can wash out softer types of gravel. There are several ways to ensure good drainage around your gravel driveway. A gravel driveway can be dressed up with edging. The most popular edging materials are pavers or blocks, though concrete is sometimes used as well. Driveway edging is also useful to hold crushed stone and pea stone in place rather than it spreading into the yard. The driveway should be excavated wide enough to accommodate the edging material. Then, the base aggregates are poured and compacted the full width of the excavated bed. The edging is installed on top of the base before the top layer of gravel is installed and compacted. It depends on the scope of the project. Factors that push costs toward the upper end of the spectrum are deeper excavation, excavating wooded property and higher trucking costs for jobs distant from the gravel source. Then, of course, there are potential extras such as drainage and edging. These are national average costs, and costs are per square foot unless indicated. Gravel driveways require ongoing maintenance to keep them in good repair and looking like new. These maintenance tasks are often handled by the homeowner or a handyman rather than by a driveway contractor. 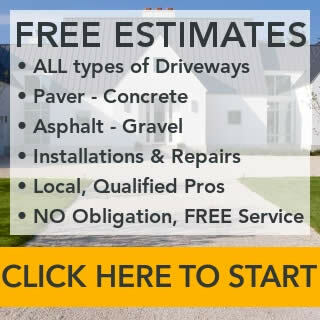 When these issues arise, it makes sense to hire gravel driveway experts in order to ensure that the work is done correctly.